There's an opportunity for digital transformation to help all industries meet sustainability goals and reduce their carbon footprints. Every business is now a digital business in one form or another. And in the spirit of "making IT good for society" (in the words of the British Computer Society), there's a tremendous opportunity for the technology community to make a difference. The scope of this opportunity now extends well beyond green IT to focus on using digital transformation to help all industries meet their sustainability goals and reduce their carbon footprints. While the concepts of green IT and sustainable IT were originally focused on IT operations and the technology product lifecycle, the new call to action as companies undergo digital reinvention is for them to give environmental factors early consideration in their planning and to extend the scope of their sustainability improvements beyond IT operations and across many of their digitally transformed processes. Done correctly, digital transformation can make a large contribution in helping organizations, cities and nations better meet their sustainability goals -- including those laid out by the Paris Agreement on climate change, which has recently gone into force. The agreement is “a global and legally binding agreement to reduce greenhouse gas emissions to limit global warming to well below 2°C." It’s estimated that information and communications technology (ICT) devices, such as IT-enabled smart grids and buildings, have the potential to deliver a 20% reduction in global carbon emissions by 2030, and over $11 trillion in new economic benefits. However, done incorrectly, digital transformation initiatives can often hinder rather than help the issue. For instance, I recently noticed a major grocery chain that, when implementing its new mobile app enabled grocery pickup service, has started to bag one item per plastic grocery bag. Not only does this practice far exceed its in-store use of plastic, considering the recent trend to ban plastic bags completely, this seems like a step in the wrong direction. In an era where single use plastics are being singled out as a major pollutant (for example, by 2050, oceans will contain more plastic than fish by weight), this is clearly something that needs to be improved. With digital in everything we do, there’s now a far broader opportunity for IT to make a difference -- and it spans all industries. 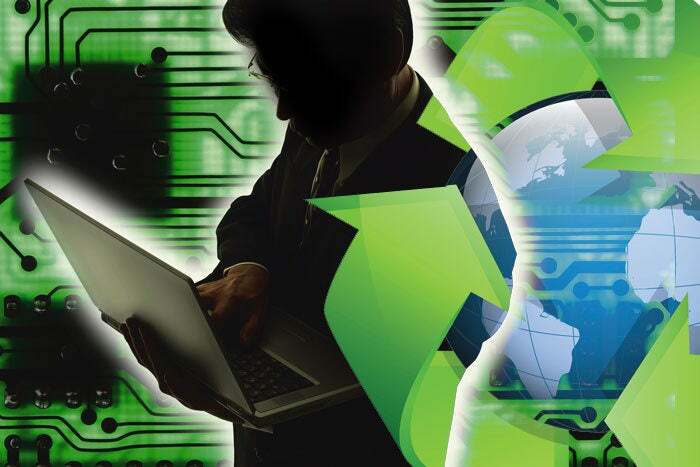 The challenge for companies and organizations is to build on the successes of their green IT initiatives and to pursue similar improvements across their new digitally-based business models and processes. Much of this work involves close industry collaboration with suppliers and partners across the entire value chain, and the development of a circular economy whereby we keep resources in use for as long as possible, extract the maximum value from them while in use, and then recover and regenerate products and materials at the end of their service life. In addition to these industry collaborations, and new circular economy approaches, it will be vital to look at each of the emerging and enabling technologies within digital transformation initiatives to determine how they can be uniquely leveraged to unlock substantial improvements in sustainability. For example, as I’ve recently learned from Mastering Digital Business, a new book on digital transformation published by the British Computer Society, smart parking has the potential to create a significant reduction in CO2 emissions. It can do this by saving drivers time in looking for parking spaces. The technology involved includes mobile applications, IoT parking sensors and powerful analytics. Recent smart parking case studies have shown a 30% reduction in greenhouse gas emissions in cities, a 10% reduction in traffic, and an increase of 2% in local GDP. Overall, when we look at mobility and logistics, it’s estimated that smart mobility solutions can potentially reduce global emissions by 3.6 gigatons (Gt) carbon dioxide equivalent (CO2e) by 2030. IoT, intelligent automation and machine learning technologies are playing a key role in smart homes, buildings, factories and cities and have the potential to significantly improve energy efficiency. Google’s DeepMind machine learning capabilities, for example, have reduced the Google data center cooling bill by 40%. In addition, even blockchain technologies are being explored in the context of “virtual power plants” that enable energy-generating resources, including residential solar panels, to be connected to smart grids in a highly-distributed, efficient and transparent manner. Overall, it’s estimated that IT-enabled smart grids can potentially save 6.3 billion megawatt hours (MWh) of electricity and reduce global emissions by 1.8 gigatons (Gt) carbon dioxide equivalent (CO2e) by 2030. In terms of alternate energy sources, smart factories such as the Tesla gigafactory are powered by renewable energy sources with the goal of achieving net zero energy. Apple is also working toward 100% renewable energy use and recently announced a joint venture with Nevada Energy (NV Energy) to build out 200MW of photovoltaic solar capacity to power its data center in Reno, Nevada. Google plans to power all of its global data centers and corporate offices from 100% renewable energy in 2017 and now uses more than 2.6 billion watts of wind and solar energy. We’re also seeing new VC funds focused on next-generation, zero-carbon energy technologies such as Breakthrough Energy Ventures, which was announced in December 2016. 3D printing is another emerging technology example. By localizing the production and manufacture of goods, 3D printing can also help to reduce CO2 emissions from shipping and freight. While there’s more work to be done to study the various pros and cons of 3D printing for the environment, some of the early studies have pointed to 3D printing potentially reducing the energy and CO2 emission intensities of industrial manufacturing by around 5% by 2025. In addition to using emerging technologies such as IoT, intelligent automation, machine learning and 3D printing to reduce CO2 emissions from various consumer and industrial business processes, many of these technologies can also play a key role in the monitoring and measurement side. In the case of blockchain, it’s being explored as an alternative carbon pricing instrument, and there are several examples of new forms of digital currency, such as the Earth Dollar, that are tied to the state of the natural environment. The words “digital exhaust” have typically referred to data that’s a by-product of online activities. It’s now time to turn our attention to a different kind of exhaust and, in an era of digital reinvention, think about how we can reduce our environmental “exhaust” through new digitally-sustainable business models and processes.